Many individuals may not realize the extent of their injuries after a car accident or hesitate to get help from a Boca Raton car accident lawyer because they do not believe their injuries are serious enough. Check out this site here to read more about the possible long-lasting effects from car accident injury. If you were involved in any type of car accident, then chances are you have suffered from some injuries—even minor injuries—vehicle damage or had to contact your insurance company. These are ALL situations where you could use a car accident attorney. Every car accident follows the statute of limitations, which gives you a window of time to file a claim. Without an attorney guiding you, you could miss out on the opportunity to file a claim altogether if you wait too long. Speaking to an experienced lawyer does not obligate you to file a claim, so it’s better to make an informed decision after getting answers to your questions. Additionally, many people make the same mistakes after a car accident, costing them their claim, and even the potential for a settlement. You might think that the insurance company is on your side but trying to work with the adjuster of your insurance company and the other driver’s insurance company can quickly become confusing. In fact, it might even seem like neither party is concerned about the injuries you have sustained. This is because an insurance company’s primary goal is protecting their interests—not yours. Figuring out what you need to provide to the insurance company, as well as what you don’t need to provide, is critical for protecting your future. This is one way in which a car accident attorney can be beneficial to your case. A car accident attorney will advise you which information to submit so you only provide what is mandatory. You could potentially provide them with information that could compromise the integrity of your personal injury claim, which is consulting with a Florida car accident lawyer is important. There are many different pieces of evidence that are critically important in your car accident claim. An experienced car accident attorney can help you to determine what evidence is most applicable and organize it in a chronological fashion for presentation during settlement negotiations or trial. In the immediate aftermath of an accident you are suffering pain and may feel out of sorts. It’s all too easy to accept a settlement offer—even though it’s significantly less than what you might deserve. The number might seem appropriate initially, but it may not be sufficient to support you over the long term. This is one more reason why an experienced car accident attorney can help you to determine whether the settlement is reasonable and when it is necessary to move forward with further negotiation or even litigation. It’s never easy to make these decisions on your own but working with a car accident lawyer is… A Florida car accident attorney has experience in settling car accident claims and knows what it takes to assess a case and what is needed to acquire a proper settlement. You don’t want to find out the hard way one day that your car accident settlement didn’t get you nearly as much as you needed. 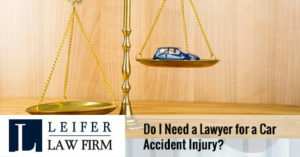 Protect your future with a car accident lawyer. Visit here to get started with a Boca Raton car accident lawyer now.